I recently conducted a small poll and it turns out that SQL Mobile is the most requested topic (see ongoing voting results here). 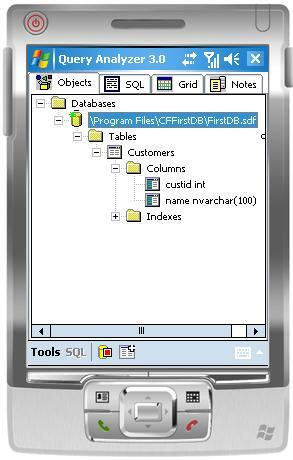 So in this tutorial, we will cover how to create a SQL Mobile database for the PDA or emulator. 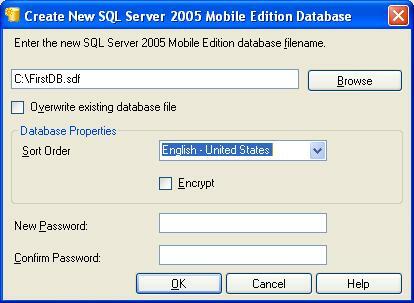 Having seen the SQL Server Express (mentioned here), let's now look at SQL Mobile. Being the successor of SQL Server CE 2.0, SQL Mobile is Microsoft's lightweight database server that has a small enough footprint (~1.5MB) to fit and run smoothly in a Pocket PC device. It is included in Visual Studio .NET 2005, so you don't have to install anything as a developer. 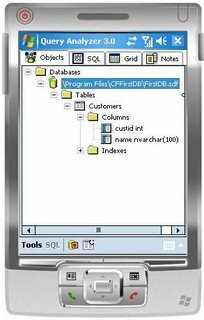 For end users, SQL Mobile can be installed on the Pocket PC 2003, Windows Mobile 5.0, Smartphone 5.0 as well as Windows CE 5.0 platforms. Word has it that SQL Mobile will be pre-installed in the ROM of all new Windows Mobile devices, just like Compact Framework 2.0. In terms of features, SQL Mobile offers transactional support, multi-user access, as well as synchronization and replication with back-end servers. In terms of competition, I'm not too sure if these few players are still fighting close: Sybase SQL Anywhere, Oracle Lite and IBM DB2 Everyplace. Alright, let's dive in to create our very first SQL Mobile database. Start Visual Studio and create a new smart device project. 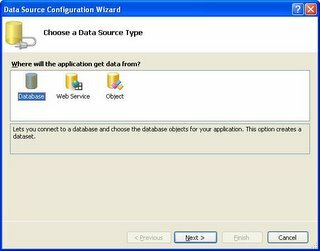 Click Data in the menu and select "Add New Data Source..." to see the following dialog window. 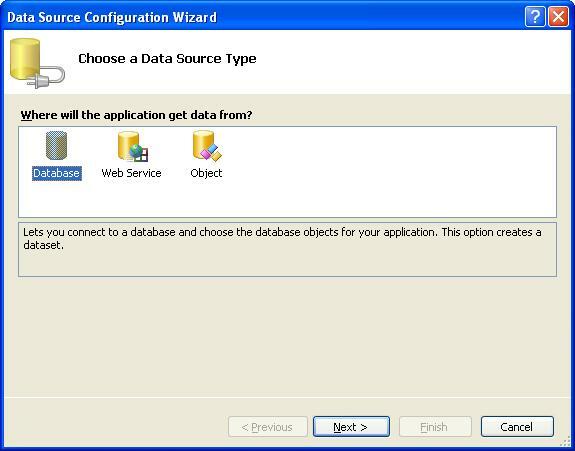 Select the Database icon (to indicate that you are creating a database) and click Next. In the next screen, click "New Connection..." to create a new database. 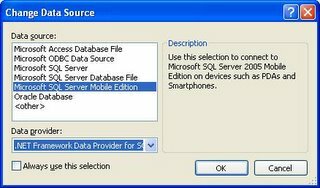 Select "Microsoft SQL Server Mobile Edition" as the Data Source and leave the Data provider as ".NET Framework Data Provider for SQL Server Mobile Edition". Click OK.
Back at the "Add Connection" dialog, leave "My Computer" radiobutton selected, and then click "Create" to specify the filename of the SQL Mobile database. Enter "C:\FirstDB.sdf" for the filename and leave the other fields as they are (you can also specify the password here, but we leave it empty for convenience). Click OK. If prompted on the empty password, click Yes. You may now click "Test Connection" to check if the database is in order. Click OK. Back at the first dialog window, click Next, and click Yes to add the database file to your project. In the next screen, click Cancel as we are not using generated DataSets in this tutorial. You will notice that the FirstDB.sdf has been added to your project. Click on it and press F4 to check that its "Copy to Output Directory" property is "Copy if newer". This means that the file will be copied to the emulator if the emulator does not have a copy or have an older copy. Now, from the menu, click View-> Server Explorer. And in the Server Explorer pane, click the "Connect to Database" icon (2nd icon from the right; or move your mouse over each icon to see the tooltip). Test the connection and click OK. There's nothing interesting in your form. However, open File Explorer and browse to the folder which contains the deployed files (at \Program Files\yourProjName). You should see a file with the name "FirstDB" there. The .sdf extension is not displayed. Click on this file to open it with Query Analyzer. 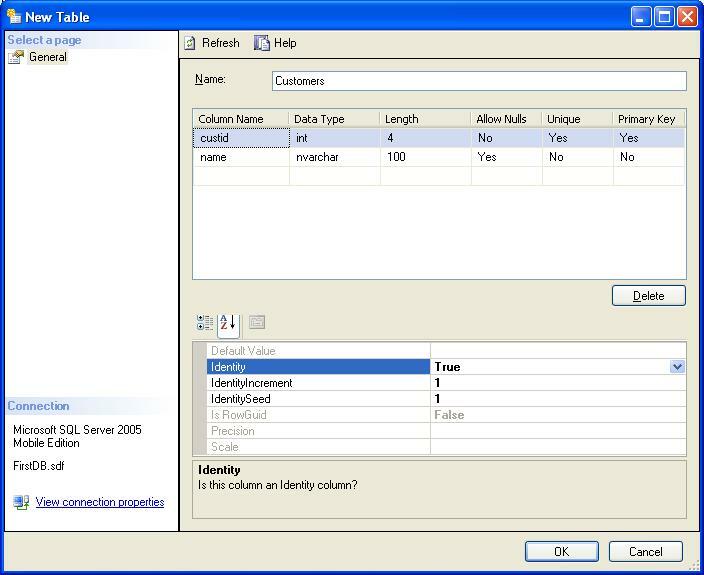 Query Analyzer allows you to explore and manage SQL Mobile databases from within the PDA environment. That's it! You have created a simple SQL Mobile database and transferred it to the emulator/device. Part 2, coming soon, will cover how to create a SQL Mobile database programmatically. Here's a nice post from TECHQUIK with MSDN links on how to manually install SQL Mobile and Query Analyzer to a device (not via Visual Studio deployment). # Select "Microsoft SQL Server Mobile Edition" as the Data Source and leave the Data provider as ".NET Framework Data Provider for SQL Server Mobile Edition". Click OK.
Microsoft SQL Server Mobile Edition isn't an option. I have installed the Mobile SDK. What am I missing? hi dru, I installed the Visual Studio 2005 Professional Edition and the Windows Mobile 5.0 SDK, and SQL Mobile was provided by default. In your case, maybe you need to install the SQL Mobile SDK by accessing the first link on this page. Hope this helps. Please let me know if you still face the same problem. SQL Mobile is the latest incarnation of SQL CE. So for your case, you will be using SQL Mobile if you use MS latest tools (i.e. VS2005). However, if you are still using the older tools or even CF1.0 (note: most OS's are backward compatible, part of MS strategy), then SQL CE it will be. please can you tell me how to know the right connectionstring on the PDA for SQLMobile? dim connStr = "Data source='.\firstDB.sdf'"
A request to send data to the computer running IIS has failed. For more information, see HRESULT. The operation could not be completed." I've turn off the firewall, turn off the antivirus, plug the LAN cable but still error. And want to ask about SQL Mobile, When I choose the Merge, the uniqueidentifier will be add at my table right?what should I do at inserting query process, I cant just insert it with NULL value right? After my subscription doing input data, is it my publications will be automatic updated? I had followed the steps listed above and created the database successfully, however, how can i retrieve and display the data to the application which is developed? How about a tutorial on taking an existing SQL Server instance and mirroring so-to-speak the schema in a SQL Server CE db? Well everything works good for sure but when I try to make a query I can not save it for some reason neither does there seem to be any way to make any use of the query I just created other then running it in the VS 2005 developing screen. Making it utterly useless. 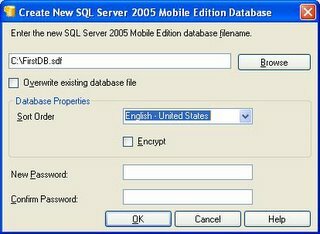 I have Visual Studio 2005, Sql server 2005 included and when I open sql server 2005 allso I can't connect to SQLMobile server it is no option there. I hear ya. I can't find the option to save my query for SQL Server 2005 Compact Edition in Visual Studio 2005 SP1. How do I change the maximum database size in the "Add connection" wizard? Thank you for the simple, straight to the point tutorial. I had been looking all day to figure out how to store my data on a PDA. Now i will need to figure out how to handle synchronization/data mapping to SQL Server DBs. You have made it happen, thanks a bunch. Maybe someday you could post on the 'synch' techniques. how to synchronize sdf data to sql server DB? or to another spreadsheet like excel? does anyone know the tool for this synch? An attractive and modern looking components for .NET Compact Framework are offered by Bee Mobile. Their components also provide data binding which allows you to easily connect your data base with the component and display the data fast and comfortably to the screen of the mobile device. i am developing the smart device application on vs2008 and when creating new database it does not show "SQL Server Mobile Edition"
its showing me "Microsoft SQL Server Compact 3.5"
Co-founder of OpenNETCF mentions my blog!